Browse all our fantastic properties below to find the perfect place for your snowy retreat. Our best properties are conveniently located in this cosy village within walking distance of the Buffaure cable car and the resort centre, making for an easy week in the mountains. 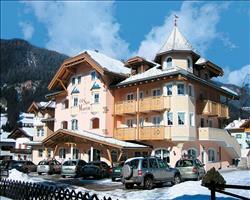 We love the location of Hotel San Nicolo, just a short stroll to both the Buffaure cable car and resort centre. 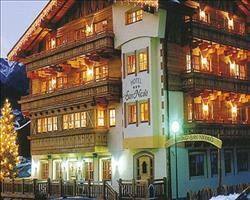 This chalet-style hotel has a warm and friendly atmosphere, perfect for a traditional mountain stay. The charming Hotel Sas Morin offers another quality stay in the heart of the town, surrounded by stunning views of the peaks. Keep an eye out for properties offering childcare services if you’re travelling with youngsters who are too young to ski and if you fancy a touch of luxury you may want to book a property with wellness facilities on-site. If your chosen hotel doesn’t have its own spa, this isn’t a problem in Pozza, where the natural baths of the Terme Dolomia spa provide the perfect pampering. Hotels with half-board options mean breakfast and dinner is included in the price and if you book your package deal with flights and transfers included you’re looking at brilliant prices.